Why, why, why is it so warm? 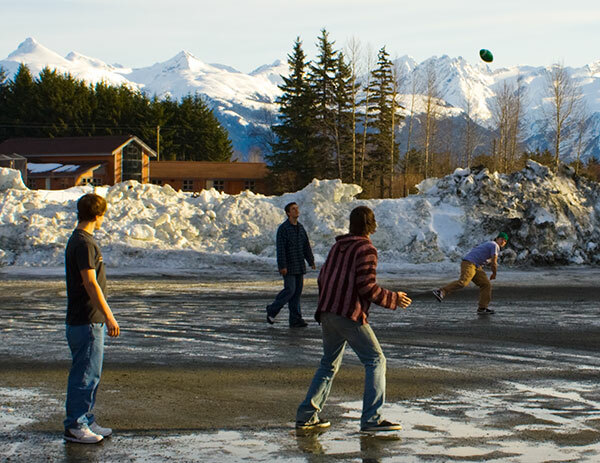 Haines High School students throw around a football in the school parking lot on 18 Feb.
Why #1 –compared to what? Above freezing temperatures have never been too rare, even in mid-winter, in SE AK (sometimes referfed to as the banana belt of Alaska). In 1977 Juneau had 29 consecutive days with highs 40F (5C) or higher starting on Jan 30. 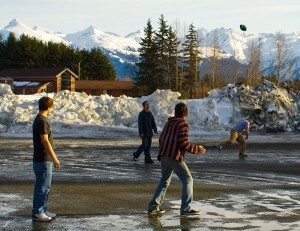 In January, Juneau averages about 16 days where the high breaks 32F (0C) and 19 in February. Roughly 2/3 of the panhandle is warmer yet. But since the past several winters have been fairly “wintery” with typical or colder temperatures and plenty of snow (record amounts in some cases), the contrast is hitting us. Summary: yes, it’s a long warm spell, and some records are falling, but it’s not an unprecedented or even all that unusual situation. So why does SE AK get these warm spells and what’s causing this one? Stay tuned…that’s why #2 and we’ll explore that in the next post.